Out of all the seasons that put on a wild show in the Wolverine State, but things change once temperatures drop and snow starts to fall here. 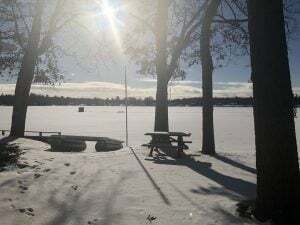 Sure, spring, summer, and fall have warmer weather and plenty of fun activities, but winter in Michigan allows residents and guests to pull out their skies, snowmobiles, and snowshoes so they can get out and explore the beautiful snow-covered wilderness! If you want to experience all there is to see and do in our great state during the winter time, request access to our free Michigan Vacation Guide! Snowmobiling during winter in Michigan is one of the top things to do in the Upper Peninsula. There are four main trail systems in the UP: Munising, Sault Ste. Marie, Paradise, and Marquette. A couple of these trails connect so you can start your journey in Munising, stop in Marquette for lunch, zip up to see Pictured Rocks National Lakeshore, and then head back to Munising! A day (or a few days) of snowmobiling is a classic way to enjoy Michigan at it’s finest during the winter time, especially for adrenaline junkies! Munising, Pictured Rocks National Lakeshore, and Tahquamenon Falls State Park all have tremendous waterfalls that freeze over in the winter. These areas have a mix of majestically flowing water and several frozen waterfalls during winter in Michigan. You can watch daring outdoors enthusiasts climb frozen water cascades near Pictured Rocks National Lakeshore, and in some cases, there are free clinics offered for beginners. Tahquamenon Falls doesn’t freeze over, but it’s still a fantastic place to stop during a snowmobile ride or a drive through the UP due to the sheer sight of the second largest waterfall east of the Mississippi River. Northern Michigan has more than a fair share of excellent ski areas to hit during winter time in Michigan. Crystal Mountain and Nub’s Nob offer the widest range of activities and the largest concentration of ski slopes. If you’re looking for a small taste of skiing on a budget, Hickory Hills Ski Area outside of Traverse City is a great intro to skiing. Traverse City crams all of the best things to do in Michigan into one place. Skiing, snow tubing, fat tire biking, shopping, indoor waterparks, movie theaters, dining, wine tours; you name, it and Traverse City has it. You can also drive over to Sleeping Bear Dunes National Park where Nordic skiing, hiking, and sledding are fun ways to spend the day on Lake Michigan’s shoreline. Gaylord has an extensive trail system of cross-country skiing and snowshoeing trails around the town center that branches out into the beautiful wintry woods. This fun winter activity is easy to learn for beginners and is a perfect way to experience the great outdoors (and get some exercise). Fat tire biking is a fantastic way to get out and explore the Wolverine State’s great outdoors in the snow! Several trails including Merrell Trail, Deep Lake Trail, and Cannonsburg Ski Area are all great spot to ride around the outskirts of Grand Rapids. Grand Rapids has tons of activities for residents and guests during the winter time in Michigan. Go ice skating in Rosa Parks Circle before heading to one of the breweries or bars in downtown to grab a craft beer or cider. The Winter Beer Festival draws a big crowd in February even in the cold weather! Freshwater Vacation Rentals is your key to the perfect Michigan winter vacation. With properties across the state in the UP, Northern Michigan, West Michigan, and Eastern Michigan, you can find your ideal fit in the area that you want to stay in during your trip! Browse our rentals and start planning your vacation today! We look forward to welcoming you to the Wolverine State! Your Guide to the Most Outstanding Ways to Celebrate Fall in Michigan — What are 7 of the Best Attractions in Michigan’s Upper Peninsula?